The Abu Garcia Salmo Seeker Spinning rods feature crisp, 30 ton graphite blanks for incredible performance and action and are built with a 4 piece design making the rod perfect for the travelling angler. This range of spinning rods feature a crisp, medium/light action and are constructed from 30 ton graphite for high durability and strength. The blanks are also extremely light weight, making the rod easier to handle and comfortable for all day use. The rod is fitted throughout with quality LS guides and is finished with a stunning, high quality AAA cork handle. Each rod is also supplied in a cordura tube for storage and to keep them safe and secure when transporting. 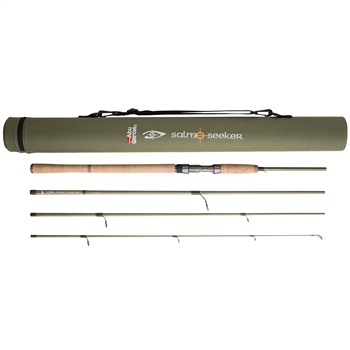 The Abu Garcia Salmo Seeker Spinning rods feature stunning olive coloured blanks and are available in 8ft, 9ft and 10ft models that you can select from our drop down menu.